Blind has been announced by his old club. AJAX HAVE COMPLETED the £14 million signing of Daley Blind from Manchester United, the two clubs have confirmed. The Netherlands international moved to Old Trafford from the Dutch side in 2014 and went on to make 141 appearances for the Red Devils, winning the FA Cup, the EFL Cup and the Europa League. He has now returned to his homeland and will be hoping to add to the four Eredivisie titles he won during his initial stay at the club. An agreement between Ajax and United was initially announced on Monday, with it expected that Blind will be signing a deal through to 2022 with the Amsterdam-based outfit. At 28 years of age, he should be at the peak of his powers and will be hoping to deliver his best on a consistent basis back in the Netherlands. He has been unable to do that in recent seasons, with Jose Mourinho having often favoured other options since taking the managerial reins at Old Trafford in 2016. Blind was, however, to prove a useful asset for United throughout his time at the club, with his versatility allowing him to cover a number of different positions. He figured at centre-half, left-back and holding midfield for the Red Devils, with his most productive season in England proving to be the 2015-16 campaign under Louis van Gaal in which he made 35 Premier League starts. There were just 12 months left to run on his contract at Old Trafford heading into this summer and a move to pastures new had been mooted for some time. 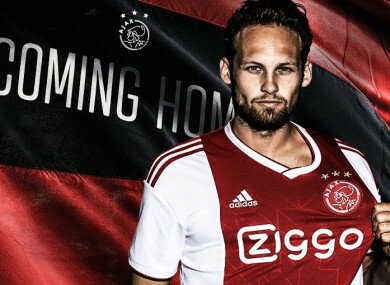 Ajax have now got their man, with Blind ready to open a new chapter in his career after four enjoyable seasons in the English top-flight. First of all I want to say how proud I am to be a part of the Manchester United family,” he wrote on Twitter. “To play for the biggest club in the world with such a history meant a lot to me. I had four great years with four trophies! “I want to thank everyone, the managers, coaches, the medical department, everyone who helped me to settle in so quick at the beginning. Of course, my team-mates and last but definitely not least the fans! Email “'It's time to go home' - Blind leaves Man United after four years to return to Ajax”. Feedback on “'It's time to go home' - Blind leaves Man United after four years to return to Ajax”.